Summer brings an abundance of luscious and healthy fruits and vegetables. It's easy to buy more than we can eat, which sometimes results in #foodwaste. “Food waste presents a major challenge in the United States. Estimates suggest that up to 40% of the food produced nationally never gets consumed, causing substantial economic and environmental harms. Wasted food utilizes vast quantities of precious land, water and human resources, yet rather than nourishing people, it feeds landfills, producing methane gasses that poison the environment. Much of the food waste (43%) occurs at the household level." This poster played an important role in discouraging food waste and encouraging food conservation on the American home front during World War I. Noted artist Edward Penfield created the poster. It's held in the Library of Congress, Prints and Photographs Division. Here's my take on food waste. 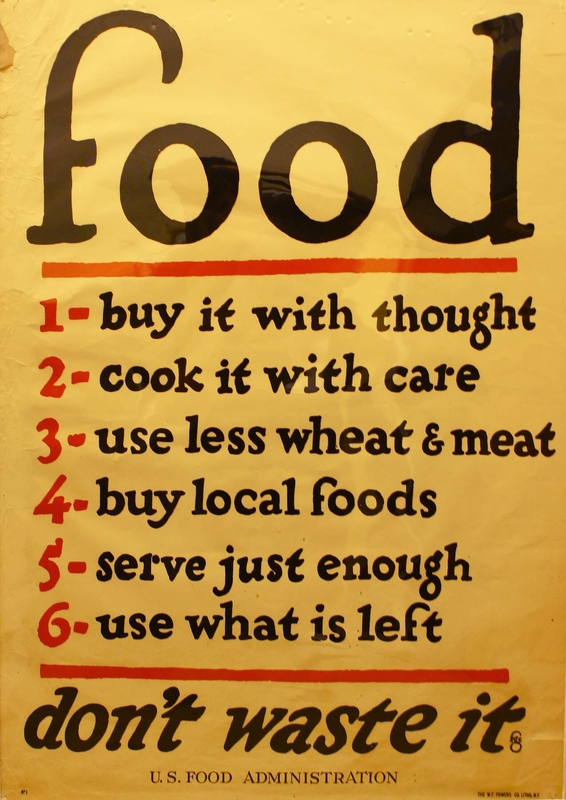 It goes back in part to lessons I've learned from studying World War I (WWI), when the American government set food conservation goals (along with goals for local food production via Liberty – later Victory – Gardens). I'm a big proponent of both reducing food waste and producing more food in communities via school, home and community gardens. Big point: the World War I poster included in this post has advice we'd be well served to heed today. It's an iconic poster from World War 1. Food…don't waste it. The image is regularly shared on Twitter and Facebook. The original was produced in 1919 by the United States Food Administration, under the direction of the newly appointed food “czar” – Herbert Hoover. The poster was reissued during World War II. It's been revised in recent years by individuals and organizations interested in encouraging an ethos incorporating local foods and sustainability. 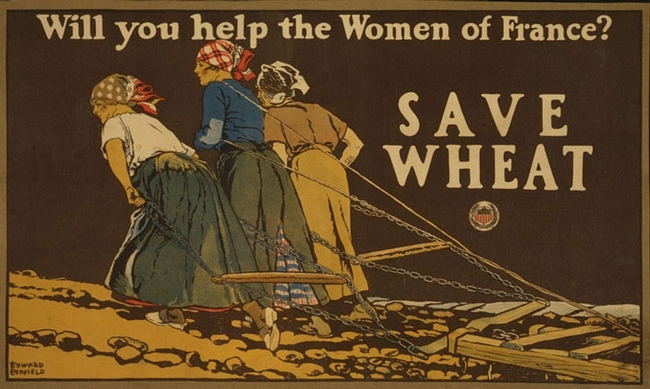 While I'm the UC Food Observer, I also dabble in the history of wartime poster art. I'm often asked if this is a contemporary mock-up made to look and feel vintage. It's not a mock-up. It's the real deal, produced 95 years ago, with messages we should embrace today. The original poster has six rules that we'd be well served to follow today. The fourth rule – buy local foods – is somewhat of a surprise to people today, because the notion of buying local seems somewhat modern. But in WWI, the U.S. government encouraged the local production and consumption of food, in part, to free trains to more effectively ship troops and war matériel. Many land grant institutions, including the University of California, host master food preserver programs. These programs teach best practices on food safety and preservation to volunteers. The extensive training program prepares the volunteers to work in their community educating others on the safe practices of food preservation, including pickling, drying, freezing, canning and fruit preserves. Thinking about gardening? Do we have resources for you! The University of California sponsors the state's Master Gardener Program, which fields more than 5,000 volunteers in communities across the state. The Master Gardener Program is a national program, housed at the land grant institution in each state, but it's also connected to the USDA. Free gardening resources are available here. Advice to grow by…just ask. Food waste is both an ethical and environmental issue. It should concern us that we waste nearly 40% of the food we produce and purchase in this food-abundant nation. For an interesting comparative statistic, consider this: our nation produced about 40% of the fruits and vegetables we consumed on the American home front in World War II in school, home, community and workplace gardens. That was the result of the iconic Victory Garden program (which actually got its start in WW1). Three messages then: participate in the national effort, commit to wasting less food, and if you can, produce some food of your own. Notes: There are many additional resources about #foodwaste. Connect: ReFED, a collaboration of nonprofit, government, business and foundation leaders, released a report in 2016 that identifies a number of potential solutions to the food waste challenge. Read: Dana Gunders of the National Resource Defense Council authored a 2012 report called Wasted that sparked much of this work. Dana also authored a book called Waste Free Kitchen Handbook: A Guide to Eating Well and Saving Money by Wasting Less Food, both of which are great reads. Read this piece about the relationships between food, farming and the environment (including food waste). Eating what's on your plate is one of the best ways to tackle climate change. View this episode of Climate Lab, a six-part series produced by the University of California in partnership with Vox. The production of food exceeds the demand by 20%, still, every 9th person in the world is hungry, according to the World Health Organization. So, instead of just focusing on the production, we need to make sure that the produced food is available for consumption and not getting spoiled.